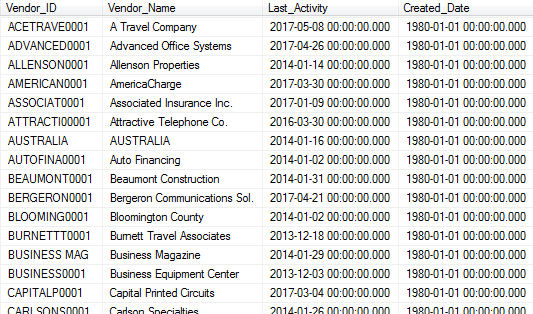 I have seen many requests recently for a way to see what Dynamics GP vendors have had no recent activity. Since ‘recent’ can mean different things, I thought I would put together a view that shows the last activity date for each vendor. Once you have this you can easily filter for whatever date range you need. I also added the date the vendor was created, since a brand new vendor might not have any activity yet. It looks like it is not recognising the table names which look correct from what I can see. Are you sure you’re running the script against the company database in SQL? Those errors sound like you might be running it against another database that does not have those tables. Hi Victoria. You were right. I’m very new to SQL. All working fine now. How do I send the output to Excel? Thank you Victoria for sharing so many of these SQL gems! Hi Victoria, sorry to be a pest. When I use either of these methods I do not get the headers, just the data. Also, is there a similar report for sales? For sales – please take a look at my page with SOP SQL views. Hi Victoria, we are using GP v6. The SQL version is 8.00.194. We are soon to upgrade. Most of our sales invoices happen through Wennsoft service manager so the SOP reports are no good for me. Version 8.00.194 is SQL 2000. I don’t have that installed anywhere anymore, so I cannot test this, but from Googling it, it looks like you can go to SQL Server Query Analyzer | Tools | Options | Results and there will be a setting there for including column headers with your results. If Wennsoft is not populating SOP tables with their invoicing, then you are right you cannot use my SOP queries. You might want to talk to Wennsoft about what you’re looking for to see if they can help you.